These kits are for the artist who perfers to stretch their own canvas, using the canvas of their choice. – Each kit comes complete with four bars plus appropriate braces – Smaller sizes under 30″ do not require braces – Kits with at least one side of 30″ or more are supplied with one or more braces as needed. 24″ X 30″ Standard depth (3/4″) X 1 5/8″ wide stretcher frame kit. Assemble and stretch your own. All the bars and braces, ready to be assembled with an easy tongue and groove construction. 24" X 24" Standard depth (3/4") X 1 5/8" wide stretcher frame kit. 18" X 24" Standard depth (3/4") X 1 5/8" wide stretcher frame kit. 16" X 20" Standard depth (3/4") X 1 5/8" wide stretcher frame kit. 14" X 18" Standard depth (3/4") X 1 5/8" wide stretcher frame kit. 11" X 14" Standard depth (3/4") X 1 5/8" wide stretcher frame kit. 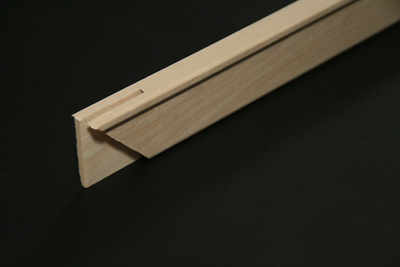 Custom Orders (3/4") X 1 5/8" wide stretcher frame kit. If the sizes that you require are not listed here, then go to Custom Orders up top of the page and enter your requests there. A service rep will return your email with the cost of your items and any shipping charges if required. You may then place yoru order by email. A Paypal invoice will se sent to you and when paid we will prepare and ship your order.